The 2008 proposed GCI coaster has been delayed, delayed, and delayed for many years. Now, it's pretty much confirmed that CGA will be getting a GCI in 2013 through rumors & the permits CGA is sending. Hope it's true... it's about time CGA gets a good wooden coaster, and according to the layout I've seen from it, it looks pretty darn well amazing! Would this be the same one that was proposed several years ago? I'm very excited to see this happen. With the removal of the 3 tallest coasters in CGA, the newest large coaster in CGA is Flight Deck built in 1993. Hopefully it will be built because CGA definitely needs this. Was that the original layout that was proposed a few years ago? I hope they get this ride too, they need another woodie, and especially a new coaster having removed three of them within the last ten or so years. Very nice, when is the park expected to make an official announcement? I'm no expert but I would think and hope that they would file the permits and wait for them to be approved before they start working. If there are any mistakes or wrong just let me know or correct me. That's very true. 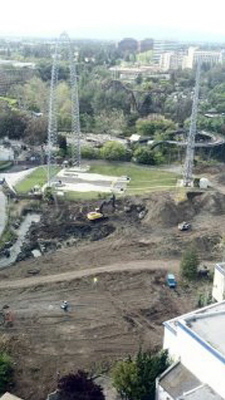 Since we've seen digging begin, we can assume CGA got all their permits. I would hope so b/c if one of the permits gets turned down the work would be for nothing and it would make them look kind of stupid for starting. Not to mention a HUGE waste of money. No everything has been approved and CF is getting ready to make an announcement soon as stated on their facebook page a few days ago. Is CF planning on announcing this in the next month or two? It would have to be pretty soon considering that digging has begun.